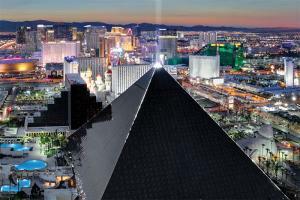 Become a fan of educational attractions at Luxor Hotel & Casino along with popular live performances. Get a rarely seen view outside of an anatomy lab of a 3-D human body form at BODIES…The Exhibition. Take a close look at over 250 authentic artifacts recovered from the infamous wreck at Titanic: The Artifact Exhibition. The multi-level, 30,000-square-foot HyperX Esports Arena Las Vegas also thrills with video game competitions, a 50-foot LED video wall and telescopic seating. A 120,000-square-foot casino appeals to other gaming preferences. Wind down at the 5-acre pool area featuring four pools, 21 cabanas and whirlpools, or choose from an array of treatments at Nurture Spa. Luxor has a 4 Green Key eco rating as a highly “green” and sustainable hotel. On and off The Strip dining, shopping, entertainment and nightlife.